‘Passing Through’ by George Fok reconstructs pivotal moments in Cohen’s career in an immersive video collage. Photo by Max Tremblay. How do you create an exhibit that accurately conveys the impact and legacy of global icon Leonard Cohen? 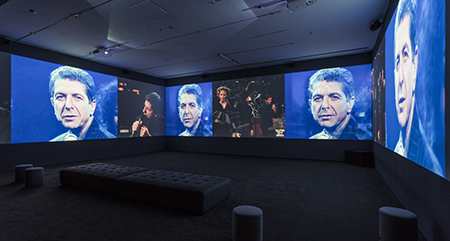 The answer, according to a new show at New York City’s Jewish Museum, is eschewing the typical exhibit format for a series of commissioned multimedia installations and displays inspired by the prolific singer-songwriter’s life and career. 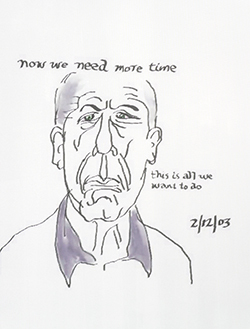 Artwork from ‘Self-Portraits, 2003-2016,’ a display of 220 drawings by Cohen. Ring the bells that still can ring/ Forget your perfect offering/ There is a crack, a crack in everything/ That’s how the light gets in. The lyric’s combination of darkness, hope and human emotion and fragility are evoked in the works of the over 40 artists, musicians, filmmakers and entertainers in the exhibit, who transform and recreate Cohen’s songs, poetry and artwork. Ari Folman’s ‘Depression Chamber.’ Photo by Guy Heureux. 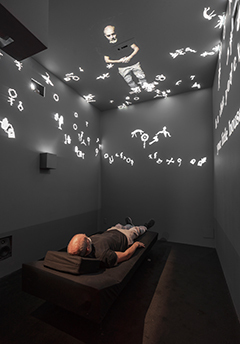 Among the highlights is Depression Chamber, an installation by Israeli filmmaker Ari Folman, a solitary, meditative experience that has exhibit-goers lay flat in a dark room, one at a time, while the song “Famous Blue Raincoat” plays and a series of images are projected onto the ceiling. Listening to Leonard includes 18 covers of Cohen’s song by contemporary artists such as Feist, Socalled, Douglas Dare and Moby. And Cohen’s most famous piece, “Hallelujah,” is represented in the installation I Heard There Was a Secret Cord, which allows visitors to participate in a worldwide virtual humming chorus of the song, created through an online portal. “Leonard Cohen: A Crack in Everything” first opened at the Museum of Contemporary Art in Montreal, the city of Cohen’s birth. The exhibit will be in New York from April 12 through September 8 before going on to Copenhagen then San Francisco.